This one has arrived a few weeks ago and I feel like I can review it now. Not great. The action wasn't smooth, it was very stiff and was hard to open. In addition it had sort of chemical smell coming from the wooden handles. The blade was sharp and centered. I realized that I will need to disassemble the knife from the start to make it work right and I did. The knife's construction is pretty simple - 2 liners (not skeletonized), 2 wooden scales (glued to the liners), 2 bronze washers, 2 screws and pivots, 1 blade, 1 stop pin, 1 standoff. It has a detent created by the liners (2 bars from both sides) and those were pushing too hard on the blade and that caused the bad action. 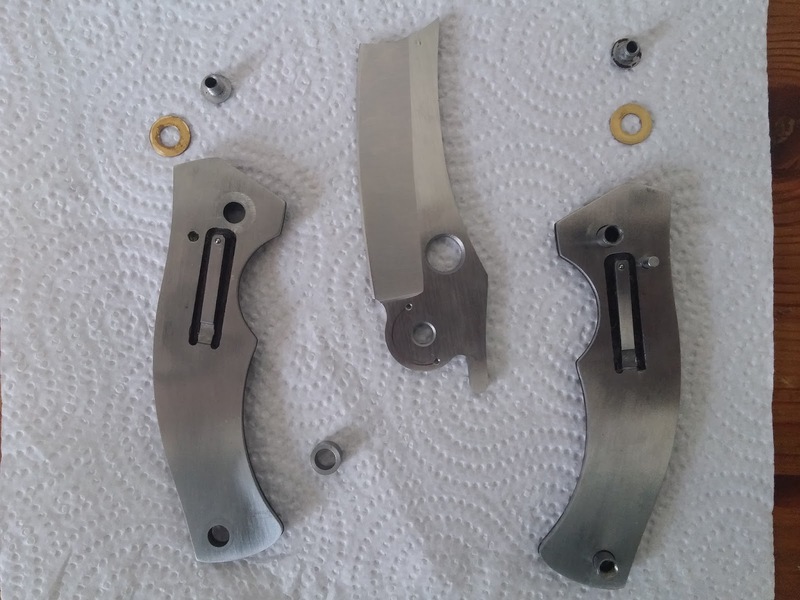 I bent them out a bit, polished the washers and assembled the knife back. The action improved significantly and it became possible to open the knife with all the methods. - Unique looks. It doesn't look like any other blade I've seen before, and it looks great and very special IMO. - Opening methods - could be opened by the trigger like a friction folder and by the hole in the blade (with a thumb and flicked out with the middle finger). Options are usually good. - The design. I like the concept that combines the advantages of a friction folder and a slip-joint, that makes it legal to carry in places where locking blades are prohibited, but also keeps the blade in the open position (like a slip-joint). - Pretty good ergos for my medium sized hand. It is also rounded and wide, so fills the hand nicely. - Like I already noticed, out of the box the knife isn't great. The smell is much weaker now, but is still present. 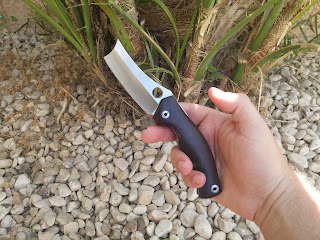 - Overall not a practical knife (for everyday carry). That is probably the knife's biggest con, starting from the blade shape, the lack of pocket clip, the weight and the very wide handle will make it difficult to carry every day (maybe only in a sheath). Overall it is definitely an interesting looking and functioning knife, that will probably bring joy to knife collectors and users, who have seen it all and used it all. It is different from any other knife I owned and that makes it special. I wouldn't recommend it for daily carry or for beginners in the knife world (because it will require to work on for a bit to make it function right).